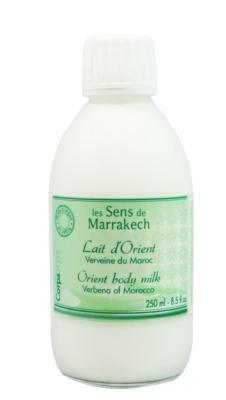 Orient body milk Les Sens de Marrakech enriched with argan oil, sweet almond oil, beeswax, glycerin, a concentrate of nourishing ingredients for this body lotion. In addition to being extra-nourishing, its spread is rapid and instantaneous penetration without leaving a greasy film on the skin. Orient body milk leaves the skin supple, moisturized and smooth regenerates. Lotion covers the body of infinite sweetness and floated soft oriental perfumes. Harvested in spring and late summer near Marrakech, lemon verbena soothes and refreshes. In Morocco, its exceptional perfume earns it a nickname full of promises: "the herb with enchantments"
Argan oil: Soothes and naturally restructures the skin. Sweet Almond Oil: Nourishes and soothes. Beeswax: Nourishes and smoothes dry or very dry skin. Glycerin: Emollient, softening and moisturizing. Apply after bathing or showering on a dry skin, light massage all over the body. Created in France in Morocco, Les Sens de Marrakech was born in 2003. 90% of the products contain argan oil. Research, development and production are carried out in Marrakech. All tests and is a partner of one of the best French control laboratories. The products are tested under dermatological control, the main ingredients are listed in percentage. The Senses of Marrakech privileges the ingredients of natural origin and local and for a conscientious use of the natural so that the products are a link with the sustainability of the environment and the cultures. Efficacy and satisfaction tests are carried out on a choice and products face and body. The products are phthalate free, paraben free, colorless, phenoxyethanol free, mineral oil free.